I expect that most people who look at my web pages know that I will fish for anything. This explains why (in addition to not catching anything worthwhile) I sometimes don't have much to write for one of my pages (could be Saltwater or Freshwater). Recently I twisted my back cutting a hedge so I eased up on the more taxing cliff climbs and rock hopping at the coast for the slightly less strenuous trudges through fields and along river banks. In fact I did go to the coast once and when I arrived at the cliff top before first light the crashing of the surf and the drag of the wind as I opened the car door told me that it was far too rough for me to fish the place I'd intended. In fact it was too rough and weedy for almost everywhere so, rather than go back home to bed, I decided to stroll a hundred metres to a spot which is always sheltered but where my fishing is liable to be disturbed by boaters, surfers and other water lovers. 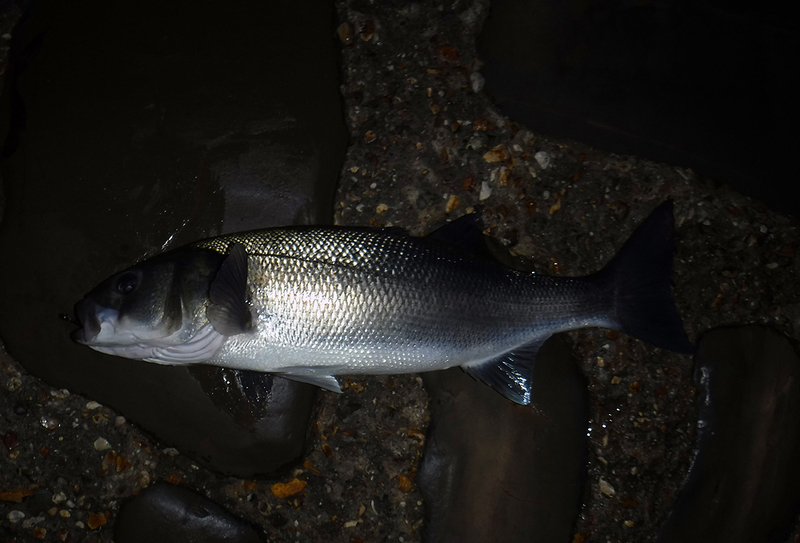 Since the weather was crap, the tide was out and it was very early I didn't anticipate any unwanted company and on reaching the sea I snout-hooked the head and shoulders of a big mackerel and swung it out into the gloom. 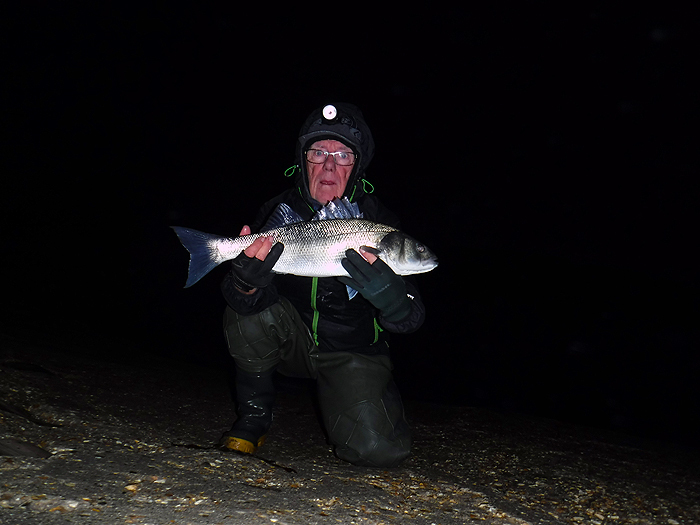 The splash told me that the bait was about five metres out and as I had anticipated the sea was, as usual, relatively calm in the spot I'd chosen. The only real problem was the stiff cross wind which made it impossible to keep tight contact with the bait. The set up was my old 11ft spinning rod, fixed spool reel, and 30lb braid with an 8/0 circle hook and no extra weight. The bait was more or less holding bottom but inevitable there was a biggish bow in the line and a fair bit of slack. Five minutes after casting out I could feel the line slowly tighten so I reeled in and found that a little piece of drifting wrack had draped iteslf over the trace knot. I was pleasantly surprised to find that the bait was clean and untouched so I picked the weed off and lobbed the bait out a short distance again. I turned my back to the wind and pulled my hood up over my head while I waited. The bale arm was open and I held the line between the finger and thumb of my reel hand. Was that a twitch? Sure enough the line went taut and began to stream out through my fingers, faster and faster it went and my heart was in my mouth. This is always the tricky moment - should I close the bale arm? I did but stupidly I'd neglected to give the fish an extra metre or two of line so it felt the pull as the bale closed and dropped the bait - disaster! I muttered the usual incantation and waited for a minute or two but clearly the fish was not coming back to have another go. I reeled in and checked the bait. It was fine so I flicked it out again. This time I didn't have long to wait but the bite wasn't the usual tearing run. In fact the take consisted of several short runs with gaps of a few seconds between them. A bass? I didn't think so; certainly not a big bass. When the bite failed to develop I reeled in and tried again. Five minutes later another erratic run develeoped with the same result as before. I was becoming disheartened but I reeled in and tried for a fourth time. Five or ten minutes later there was a tug and this time the line began to pour from the reel as a 'proper bass run' developed. I waited; five, ten, twenty metres of line ran swiftly through my light grip. Time to tighten. I took a couple of paces towards the water to give some slack and closed the bale. An instant later the rod was draggedround to my right and the clutch began to buzz. It was on! After taking a few metres of line the fish turned and began to kite round to my left where there was a mass of boulders. Now it must be close to the snags I thought and in fact I felt the line catch on something solid for a second. I clamped down on the spool and walked backwards and to my right and was relieved to feel the fish kicking again. Now it was tiring so there was no problem and it wasn't long until I slid a beautiful silver bass onto the sloping cobbles. Measure it - 70cm, it was in superb nick so round about eight pounds. Take a couple of pictures and slip the fish back into the sea - away it went - excellent. It occured to me after releasing the fish that my rod is not the usual type employed by sea anglers for fishing large baits and particularly with very large hooks. Why? Well I guess it is related to the fact that I only use circle hooks these days. In this case the rod simply has to be stout enough to cast the bait out a short distance (to where the bass are). When it comes to setting the hook it is fatal to try and strike so the rod becomes irrelevant. All that is needed is a reel check which is set tight enough to drag the (very sharp) hook into the corner of the fishes' mouth; so no need for a 'powerful' rod. It's on the shore and 'caught', note the 8/0 hook. Still dark. I must learn to smile or at least not to pull a face when I do this.